1.) To the future generations we give the ideals of Honor, Courtesy, and Hospitality. These ideals are exemplified by Our youth, especially in _____________, who is proven worthy of recognition in the Order of the Fletcher Trimaris. Thus We the Crown Trimaris so do proclaim upon the __________ day of _____, A.S._______. take hold and grow within ____________, and to encourage that growth We do name them to the Order of the Fletcher Trimaris. Set by Our hand and seal in the Anno Societatis __________, on the __________ day of _____. 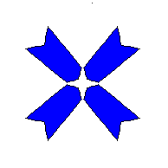 (Fieldless) Four Japanese arrow notches conjoined in saltire bases to center azure.